by Erin Ross Follow OPB Sept. 14, 2018 8:08 p.m. | Updated: Sept. 17, 2018 9:48 a.m.
At 9:30 Friday morning, a cougar passed in front of a trail camera near the location that hiker Diana Bober lost her life. The team of wildlife officials and dogs searching for a mountain lion thought to have killed Bober was quickly dispatched to the area. By 3 p.m., the hounds had treed the mountain lion and officials killed it, according to an Oregon Department of Fish and Wildlife press release. But it may not be the correct cougar. 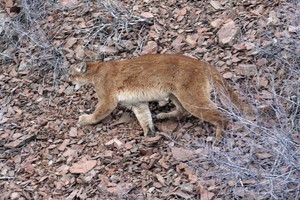 Cougars, also called mountain lions and pumas, have large overlapping ranges. ODFW has sent the cougar to the Fish and Wildlife Services lab in Ashland, where technicians will compare its DNA to any DNA that may have been recovered from the wounds on Bober’s body. It’s a process that could take several days. Police discovered Bober’s body earlier this week in the Mount Hood National Forest near Welches. 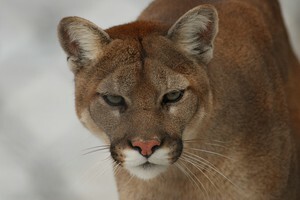 Bober had been missing for days and had wounds on her body consistent with a cougar attack. Officials say the killed mountain lion was female, but was not lactating, meaning she didn’t have young kittens. However, mountain lions stay with their mothers until the are roughly 15 months old — long past the point where they have been weaned. Bober was the first recorded death of a person by a wild mountain lion in Oregon’s history, according to officials.